SOLD!! 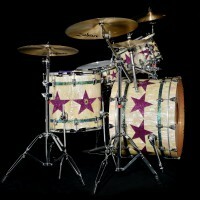 Ringo Starr’s Custom Ludwig Abalone Complete Drum Set. Authenticated and Signed. $150,000, SOLD!! I’m extremely excited to present what could be one of the most iconic drum sets ever made. This drum set was custom designed for, owned and used by Ringo Starr, arguably the most famous drummer of all time. Regardless of the connection to it’s famous original owner, this one of a kind drum set stands on it’s own merit as one of the most ornate and masterfully crafted drum sets ever built. The set is being sold by Ringo’s long time personal drum tech, Jeff Chonis. Starr gave Chonis the set and it is being sold with Starr’s approval. 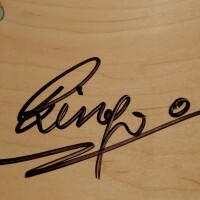 Each drum is personally hand signed by Ringo Starr. 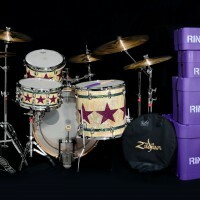 Several of Starr’s drum sets were sold recently in auction, however this is the only set that he ever signed. The set includes documentation from Starr’s lawyer and a certificate of authenticity signed by Jeff Chonis. The Ludwig Legacy Maple drum set is finished in a custom abalone shell pattern by Bill Cardwell of the C+C Drum Company. Cardwell hand cut, fitted and glued hundreds of pieces of abalone shell and purple sparkle to create this exquisite one of a kind drum set. This is the only complete drum set ever made with this type of hand cut abalone shell finish. 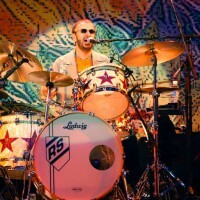 The set was used on Starr’s 2006 “Ringo Starr’s All-Starr Band tour plus television appearances and recording sessions during this era. 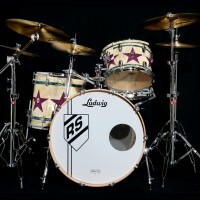 It was also featured in a 2006 Ludwig ad campaign Ringo_Ludwig Ad copy and will be the subject of an upcoming DRUM! magazine “Time Capsules” article. The set has been in Chonis’ care since it was first built. There is not a single scratch or flaw anywhere. The set is in mint condition. The Ludwig Legacy Classic Maple set includes a 24”x16” bass drum, 16”x16” floor tom, 13”x9” rack tom with a custom isolation mount and a matching 14”x6.5” snare drum. The Zildjian cymbal set includes a 20″ ride, 16″ and 18″ crashes and pairs of 13″ and 14″ hi-hats. All hardware and pedals are Ludwig. The set includes 5 purple Protechtor cases all custom stenciled “RINGO*”. In addition to the drum set are 2 pairs of Starr’s actual stage used drumsticks. 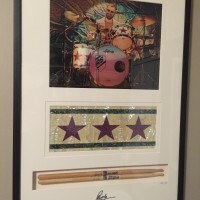 One pair is professionally framed and displayed with a photo of Ringo at this set along with a sample of the abalone finish. The drums currently reside in Los Angeles, CA and can be picked up or shipped from there. Due to the extreme high value, this set will be shipped as freight in a secure wooden shipping crate. Plan on around $1,000 for U.S. shipping depending on your location. We will ship internationally. An extensive 14 page PDF file has been created that documents every detail of this drum set. It is available by request to serious buyers. SOLD!! Payment only by cashiers check or wire transfer. Please contact seller before purchase. $150,000.00. Serious offers considered.SOLD! !